Cupcakes are perfect for any time of year. There’s nothing wrong with a great cupcake on Christmas, Thanksgiving, birthdays, and especially Easter. There are so many options for Easter cupcakes. Bunnies and eggs are probably two of the most popular. 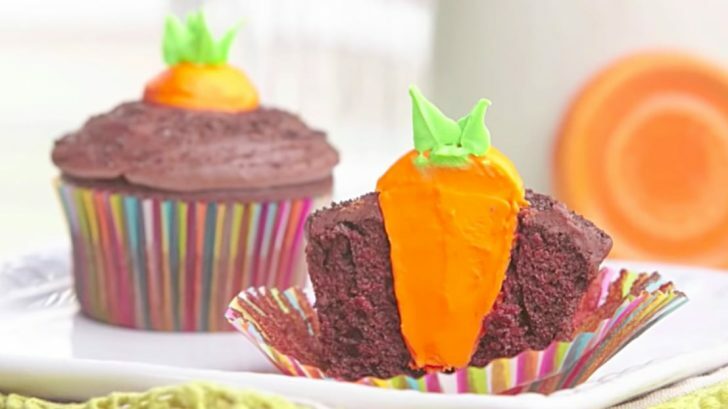 Recently, I stumbled upon a recipe that makes the cupcake look like a carrot growing in the ground! The best part? These cupcakes are super easy to make, so let’s get started! To begin, make a batch of chocolate cupcakes however you usually like. This is one of my favorite chocolate cupcake recipes, so if you don’t have a favorite, check it out! Along with this, you’ll need a couple of different butter creams: a brown chocolate buttercream, an orange buttercream, and a green butter cream. You’ll also need some crushed sandwich cookies, like Oreos. Along with the ingredients, you need a pairing knife, and piping bags with rounded and starred tips. Now that you’ve got all of your supplies, let’s get started making these little dudes. Start by frosting your cupcakes, then sprinkle them with the crushed sandwich cookies to simulate the look of dirt. Use your knife to cut out the middle if the cupcake at an angle, forming a carrot shape. Use the orange and a piping bag with the rounded tip to fill the center of the cupcake, creating the top of the carrot at the top of the cupcake. Use the green icing and the star tip to create the stems at the top. Then that’s it. You’re done! Watch the video by Wilton below to get a better idea of how to do this. Then you can chow down. Happy Easter and enjoy!